Product prices and availability are accurate as of 2019-04-13 04:24:43 EDT and are subject to change. Any price and availability information displayed on http://www.amazon.com/ at the time of purchase will apply to the purchase of this product. 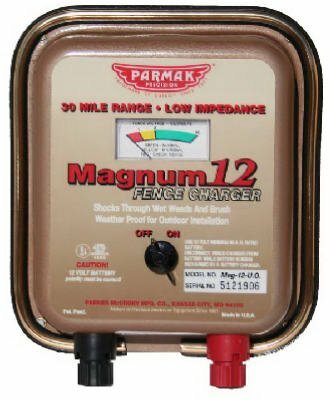 12 Volt, Battery-Operated Low Impedance Fence Charger, Solid State Circuitry, Equipped With Performance Meter That Shows Condition Of Fence, For Livestock Or Predator Control, Medium To Large Pastures, Shocks Through Wet Weeds and Brush, Weatherproof, Portable, Outdoor Model, Use With 12 Volt Storage Battery, Charges Up To 30 Miles, Includes Battery Clamps, UL Listed.